Broadband is the service that gives you access to high-speed internet. In today’s world, having access to broadband is a necessity. Unfortunately, many low-income households are not connected to the internet. This publication explains more about broadband, including its importance, benefits, availability and pricing. It also presents special programs that help low-income households get internet service. 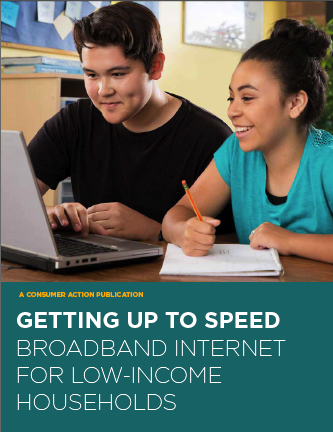 Having access to high-speed internet at home has many benefits, from increased communication with family and friends to the ability to find jobs and improve one’s health. There are many different types of technology that internet service providers (ISPs) can use to connect households to the internet. These include dial-up, cable, fiber and satellite via “fixed” lines, as well as wireless and Wi-Fi “mobile” technologies. Except for dial-up, all of these technologies enable a broadband (high-speed) connection. To access the internet, you need an internet-ready device such as a smartphone, tablet or computer. Sometimes these devices can connect directly to your mobile carrier’s network for a monthly fee. Other devices and tablets can connect only to wireless internet signals (Wi-Fi) in your home, office or public places when you are near a signal. For home-based internet, you will need a modem to bring the broadband signal into your home. (Your provider may charge a monthly modem rental fee.) To create a home Wi-Fi network, where you do not need to be connected to the modem by a cord, and one or more users can access the internet at the same time, you will need to connect via a “wireless router.” Often, modems and wireless routers come together in a single device. If your modem does not have a built-in router, you will need to connect an external router to it. The broadband technology you choose will depend on where you live (urban or rural), service offerings and price. In most areas, there are two fixed (not mobile) broadband providers—the local cable company and the local phone company. In many areas, consumers have three or more choices for mobile broadband from national wireless service providers. In most cases, you will be required to sign a contract for broadband service. Make sure you understand your contract, including any early termination fees for switching service before your contract expires. When the internet became widely available to households and businesses in the late 1990s, access was provided only by “dial-up” service, which was slow to “load” webpages and download files. Broadband internet access sold today is very fast by comparison, and users have come to expect speedy connections that allow them to do the many tasks that are now common on the internet, from banking and school homework to watching online video and keeping in touch with family. Mobile broadband, usually accessed on a smartphone or tablet computer, can vary in availability and reliability because it is relayed by local cell phone towers, and in some areas transmission towers are few and far between. “Fixed” broadband, delivered through a direct connection from the provider’s network into the home, is often more reliable. Mobile broadband is usually device specific, while “fixed” broadband allows all the members of your household to connect their internet-enabled devices (even smartphones) if you have a Wi-Fi router. However, many people like the freedom of mobile broadband, which allows you to access the internet anywhere your provider offers services. Mobile (not home-based) broadband plans are sold by amounts of access, measured in megabytes (MB) or, in larger allowances, gigabytes (GB) or terabytes (TB), of “data.” Playing (“streaming”) video or music for even a few hours a day can quickly use up your mobile data allowance. Mobile internet plans typically require a credit check and they may require you to lock into a contract. If you end the contract early, you typically must pay an “early termination fee” of $100 to $200 or more. Broadband service fees are charged monthly, which means you pay a fixed rate for your connection. With home-based access, most customers can use the internet as often as they like, for as long as they like (though very heavy users could exceed a plan’s data allowance and be charged an additional fee). Home-based internet is sold by speed, which usually is measured in Mbps (megabits per second). You will pay more for faster speeds. A broadband connection has two speeds: “download” and “upload.” When you are surfing the internet, you are downloading information from the web; when you are sending email or posting a photo, you are uploading to the web. Download speeds tend to be faster than upload speeds. Your plan is priced by the “maximum” speed it can reach; however, this can vary. Many “speed test” websites exist to help you measure and track your broadband speed. You can buy “prepaid” smartphones and data. Prepaid plans require no credit check and no contract. When you have used up all the data you paid for, you will have to purchase more if you need more access to the internet. Prepaid mobile internet can be a good way to control costs, however most plans require you to provide a debit or credit card to automatically “re-up” your plan at regular intervals, such as monthly. Following are programs providing discounted internet. It is necessary to apply for these services (not all are available in every part of the United States) and eligibility requirements vary. Live in AT&T’s 21-state service area, where it offers wireline home internet service and at least one of the five speed tiers offered under the program. Do not have outstanding debt for AT&T’s fixed internet service within the last six months or outstanding debt incurred under Access from AT&T. Speeds of between 768 Kbps and 10 Mbps are available; qualifying households receive the fastest available tier. Service providing 5 Mbps or more will cost $10 a month, and service providing 3 Mbps or less will cost $5 a month. There is no deposit or contract required, and there are no installation or internet equipment fees. In-home Wi-Fi is included, as is access to the national AT&T Wi-Fi hotspot network. Live in an area where Comcast internet service is available. Do not have outstanding debt to Comcast that is less than one year old. Housing Assistance Program: Open to households who receive HUD housing assistance, including Section 8 vouchers. Senior Citizen Pilot: Open to low-income seniors (62 years or older) receiving federal or state public assistance and residing in one of a dozen trial areas. Internet Essentials from Comcast provides low-csost internet service for $9.95 a month with in-home Wi-Fi included, as well as 40 hours per month of access to the Xfinity Wi-Fi hotspot network, the option to purchase an internet-ready computer for $149.99, and access to free digital literacy training that’s available in person, online or in print. Have in your household at least one child who receives free or reduced cost lunch through the National School Lunch Program or is a recipient of the Community Eligibility Provision (CEP) of the NSLP, and/or a senior (65 and over) who receives SSI. Have not subscribed to a Charter broadband plan in the 30 days prior to enrollment. Have no outstanding debt to Charter and no unreturned equipment. Qualifying households get up to 30 Mbps downstream, which is enough to power multiple devices simultaneously, and 4 Mbps upstream for $14.99 per month plus taxes and fees. An internet modem is included; you have the option to add an in-home Wi-Fi router for $5 more per month (or you can purchase your own). Have at least one student in grades K-12 living in the household. Have at least one member of the household participating in the National School Lunch Program (Mediacom and Cox); or have a household member participating in SNAP, TANF or public housing (Cox). Have not subscribed to internet service from Cox or Mediacom within the last 90 days and don’t have any outstanding Cox or Mediacom bills or unreturned equipment. Both the Cox and Mediacom Connect2Compete programs provide 10 Mbps speeds for $9.95 per month (plus taxes)—in-home Wi-Fi modem included. There are no deposits, installation fees or contracts. Are below 200 percent of the federal poverty level or currently enrolled in a qualifying income-based government assistance program. Qualifying households receive internet access (unlimited data at 4G LTE speeds) for as low as $10 per month with prepayment of one year ($120) and online enrollment/purchase. Three-month and six-month plans are available as well, for $13.33/month ($40, prepaid) and $12.50/month ($75, prepaid) respectively. Because all plans are prepaid, there is no credit check. New customers, regardless of plan length, are required to purchase a wireless LTE modem through the program, which costs $80. Are at or below 135 percent of the federal poverty level for your household size and state, or you or someone in your household receives SNAP, SSI or benefits from one of the other qualifying programs. You can receive only one Lifeline subsidy per household, for either phone or internet service. The monthly discount is $9.25 (up to $25 more for customers who live on Tribal lands and participate in qualifying programs). The final cost to you depends on which carrier, service type and plan you choose. If Lifeline internet isn’t available to you (check here: https://data.usac.org/publicreports/CompaniesNearMe/Download/Report), but you qualify for the Lifeline program, take advantage of the Lifeline discount for your home or wireless phone service and get your broadband through one of the non-Lifeline low-cost internet programs being offered. When you and your family are using the internet, be aware that you could be exposed to scams. Consumer Action offers many free, multilingual brochures and guides that alert you to online risks and offer ways to protect your privacy on the internet. Family Online Safety Institute offers many resources to make the online world safer for children and families.